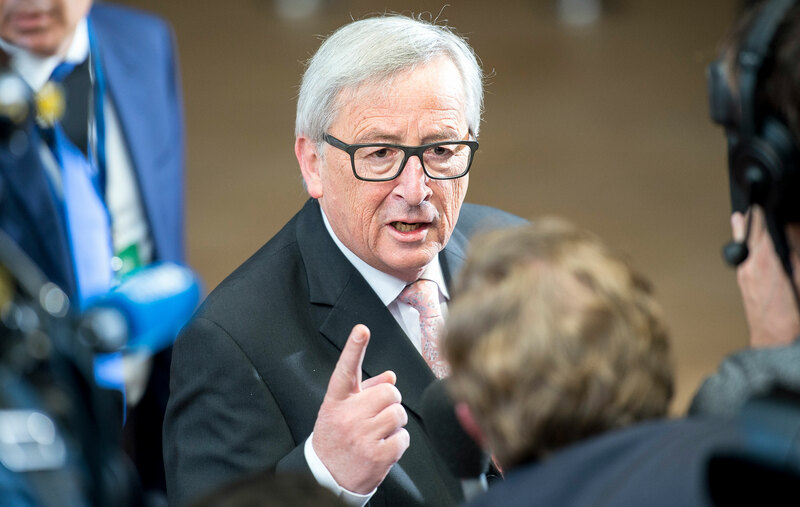 This is been a disastrous week for Jean-Claude Juncker and his gang, says David Mellor. They strutted over to London, ate what they regard as quite a poor meal and then abused Theresa May in the German press, the actions of a sub-Alastair Campbell figure, nothing like a sophisticated as dear Alastair, called Martin Selmayr. Now they may have thought they did a wonderful job. No doubt their wives and various hangers on are congratulating them on this, but they did a terrible job because how can it be in their heads to think that bullying Britain, a country that traditionally in history has not been bullyable - unlike, by the way, the French Mr Barnier. And what they're trying to do in saying "Oh the bill was €60 billion and now it's €100 billion" is, sort of, a think of your granny's age, double it, then multiply it by the age of the cat-kind of calculation. They think that we're going to fall for that, that we are going to be bullied because we are the one somehow who need the goodwill of the EU. It is not the case and I would say two or three conclusions come from this. First of all, Remainers surely now have to understand that there is no way back and that the only way to make a success of our future relationship with the EU is to demand, not from the British government, but from Brussels and sympathetic governments within the EU, that there is a proper negotiating position taken, not this kind of demand, not these kind of futile demands being made. But the one person who should wise up to this is another woman. It's not Theresa May that needs to wise up, it's Angela Merkel. The saddest thing about this week was not that Juncker made a fool of himself. The saddest thing is that Angela Merkel is making a fool of herself by allowing her ministers to somehow support the negotiating position of Mr Barnier. Let's be clear about this, as far as Angela Merkel is concerned, will the real Angela Merkel please stand up. Is the real Angela Merkel the woman who has led Germany with some distinction for more than a decade or is the real Angela Merkel the butter-fingered statesman who let a million people into Germany, causing all manner of uproar, most of them not legitimate refugees? Or is the real Angela Merkel the person who seems to be standing by while German interests, not just British interests, fade? When you look at the hold that the German industry has over the British economy, German interests are being trashed by Juncker, Barnier and their clownish mates straight out of a circus.